If you’re a California real estate professional, chances are you may have represented a buyer who purchased a home that ended up being destroyed by wildfires. If you haven’t already, you may in the future. Or, perhaps you need to deal with a client who owns a home in a wildfire affected area, which was spared and now they wish to lease their property to those who have been displaced. Nearly 1.9 million acres burned in the 2018 California wildfires, tens of thousands of structures were damaged, and wildfire risk is increasing for California homeowners. The 2018 wildfire season was the deadliest and most destructive wildfire season on record in California. In our recent risk management webinar led by experienced real estate defense attorney Jennifer L. Supman, of Manning & Kass, Ellrod, Ramirez, Trester LLP, we covered the important steps you can take to reduce the risk of a lawsuit for you and your clients. 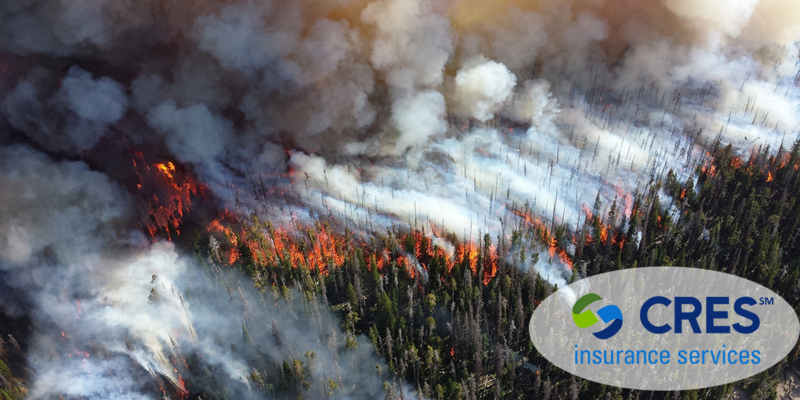 So what are the best practices for claims prevention due to the California Wildfires? If, when looking at the map, you cannot determine whether the subject property is in the fire hazard zone, you must disclose that it is, unless you obtain and disclose to the buyer an expert report stating otherwise. Disclosures need to be made on the Natural Hazard Disclosure Statement (NHDS) or on the Local Option Real Estate Transfer Disclosure Statement if your local jurisdiction has mandated use of a Local Option Disclosure. Some real estate professionals elect to use a third-party consultant to complete the form, but keep in mind, the use of a third-party does not relieve the seller or listing agent from the obligation to deliver the NHDS to the buyer. Failure to disclose that a property is in a fire hazard zone and/or misrepresentation are likely reasons for lawsuits and claims as a result of the California Wildfires. So it’s timely to brush up on your disclosure obligations and spend time with your clients to work through these disclosures. Given the Bay Area’s already dire housing crisis, individuals displaced by the recent wildfires, and/or their insurers, are bidding aggressively to lease homes in adjacent areas. In some cases, offers more than four times the actual rental value of a property is being offered to entice owners to lease their homes to displaced individuals and families. But, is it too good to be true? Yes, it is. Rent for any housing cannot be increased annually by more than 10%, as determined by the actual rent paid by the tenant at the time of the State of Emergency proclamation. Violations of this law can result in fines and imprisonment. A greater rental price is not unlawful if it can be proven the increase is directly attributable to additional costs for repairs or additions beyond normal maintenance that were amortized over the rental term. If you have a client who is considering a lease offer that seems too good to refuse, instruct them to consult with a legal professional so they can evaluate the risks. The Real Estate Professionals: Avoiding Claims from the California Wildfires webinar covered all this and more, including where you stand with insurance and natural disasters. To watch the full webinar replay, click Play on the video below. Or, if you would like to speak with a real estate broker/agent insurance expert, contact the CRES team at 800.880.2747 (toll free).